In this April 25, 1990, photograph taken by the crew of the STS-31 space shuttle mission, the Hubble Space Telescope is suspended above shuttle Discovery’s cargo bay some 332 nautical miles above Earth. The Canadian-built Remote Manipulator System (RMS) arm, controlled from in-cabin by the astronaut crew members, held the huge telescope in this position during pre-deployment procedures, which included extension of solar array panels and antennae. STS-31 was the tenth launch of the shuttle Discovery. On board were Commander Loren J. Shriver, Pilot Charles F. Bolden, Jr. (now NASA Administrator), Mission Specialists Steven A. Hawley, Bruce McCandless II and Kathryn D. Sullivan (now NOAA Administrator). 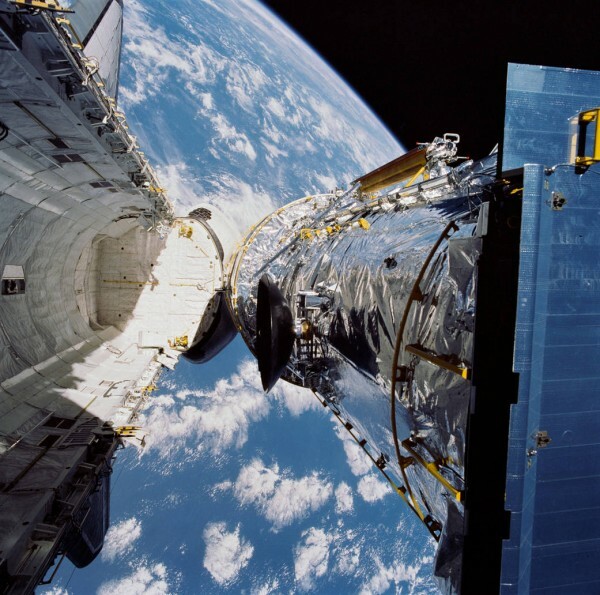 To launch Hubble into an orbit that guaranteed longevity, Discovery soared to a record altitude of 600 km.